Barbara Taylor Bradford, the author of 'A Woman of Substance', is auctioning off key pieces of her jewellery collection, in a move that is expected to net her £1.5 million. 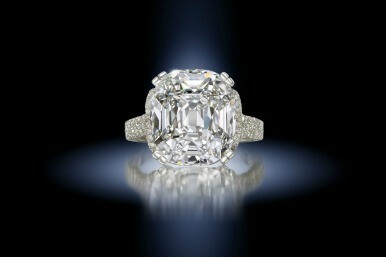 There are 40 pieces, including a ring thought to be worth £460,000, going under the hammer at the beginning of December. It has enormous sentimental value, so why sell? The collection is enormously valuable. The most expensive piece is likely to be the 14-carat diamond ring (pictured), but there are also a number of Harry Winston pieces: including an 18 carat cushion-shape sapphire ring worth £131,000, and a pair of pearl and diamond earrings worth £79,000. However, there is also incredible sentimental value for the author. Most of the jewellery was given to her by her husband, Bob. She says: "Every piece of jewellery in the auction was purchased by my darling husband. When I reviewed my collection, what really struck me is that it reveals the story of my marriage to Bob, a wonderfully romantic love affair which has lasted for 50 years." She has no children to leave the money to, and says she will give the money away to two distant relatives. Taylor Bradford says she thinks it's the right thing to do, because at the age of 80, she doesn't wear them. She said: "I thought how silly it was to have jewels in a safe that I only wear occasionally. Beautiful things need to be on display and admired. I want someone else to own and wear these pieces I have cherished and enjoyed. I want the jewelry to live again." She was due to leave them to two female heirs, but they would be unlikely to wear them, so she is selling them instead and will give the money to the women. Given that she really doesn't have any need for them, this is a clever move. The sale was already going to be boosted by the celebrity connection. Matthew Girling, Bonhams CEO and International Head of Jewellery, comments: "For anyone who loves her work, here is a once in a lifetime opportunity to buy something intensely personal, owned and loved by Barbara Taylor Bradford." Jean Ghika, Director of the Jewellery Department at Bonhams in Europe told AOL: "It's difficult to quantify the difference that a celebrity connection will make to the selling price. It's not necessarily something that we factor into the valuation but there may be a discernible difference in the selling price." The auction house has certainly seen some enormous differences in previous sale prices when there has been a celebrity connection. When pieces belonging to screen legend Deborah Kerr were sold in 2008, some went for twice their valuation. Barbara Taylor Bradford is adding to this effect, because by selling the jewellery in her lifetime she has the chance to promote the sale and create an enormous amount of interest as the pieces tour the world before their sale at Bonhams in London on 5 December. She is also able to tell the romantic stories behind the pieces - in the way a novelist can do justice to them. She has written a short history of many of the pieces, including when she was given them and why. In one, she describes being on holiday in Capri, when her husband popped out for a paper, and came back saying 'I've bought you some flowers". They were sapphire flowers in a necklace.